It's Facebook Fridays! for December 14, 2018, and you can get lucky in a hurry! The Lucky Mojo Curio Company is holding a random drawing to give away 8 spiritual supply prizes to enhance good fortune in every way. 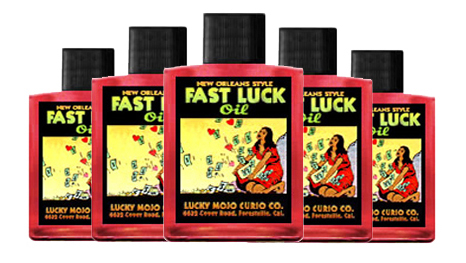 This week each winner will receive a bottle of hand-made Lucky Mojo brand Fast Luck Oil, a traditional New Orleans hoodoo formula to rub on your hands and the soles of your feet, dress your hair, and fix candles that are burned for immediate lucky outcomes in matters of love, money, and games of chance. Thanks for posting this notice, Ernie. There is still about an hour to go on over and enter the contest at Facebook. Good luck! We have a winner! In fact, we have 8 lucky winners! 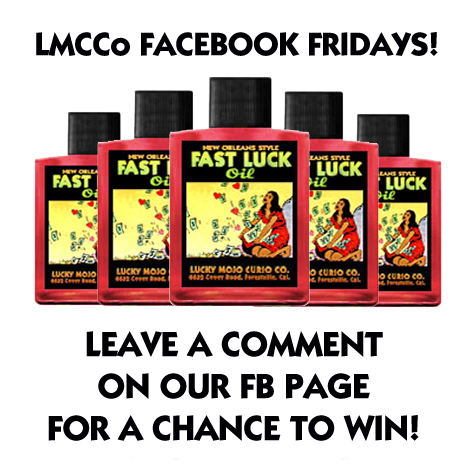 Our Facebook Fridays! winners for December 14, 2018 are: Diamond Diamond, Heather Fein, Birka Skadadottir, Samantha Mihalko Veach, Bianca Corella, Tanner Pippert, Tamrha Gatti Richardson, and Veronica Smooth.